When I saw the Miyazaki film CASTLE IN THE SKY (1986) last week, it was preceded by a trailer for a new Japanese cartoon, MIRAI (2018). 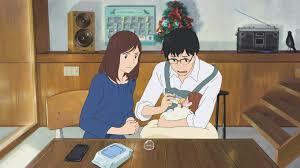 I was intrigued by MIRAI's fantasy premise, that a preschooler meets his new baby sister as an older girl. A search turned up a review from The Hollywood Reporter saying the film was a "sweet child's-eye view of the world" and a "charming, resonant work." On the basis of that and the trailer I decided to give the film a try, and I'm glad I did. 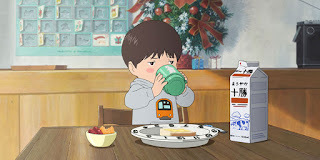 MIRAI, known as MIRAI NO MIRAI in its native Japan, is about Kun (Moka Kamishiraishi), who struggles with jealousy when his parents (Hoshino Gen and Aso Kumiko) bring home a baby sister named Mirai. Kun has strange moments when he steps into the family garden and the world changes. Kun meets the family dog in human form, who tells Kun about being angry when Kun was born; he meets his mother and his great-grandfather when they were younger; and most importantly, he gets to know Mirai in "big sister" form (Haru Kuroki) rather than as a baby. 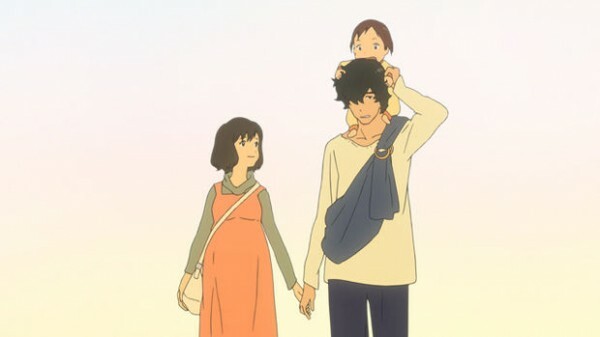 Through these adventures he learns that his family members have had their own struggles and eventually he learns to embrace his new role as "Mirai's big brother." As promised, this was indeed a lovely little movie. It did have a few crass moments -- and a couple briefly frightening ones near the end -- but on the whole it was a wonderful blend of reality and fantasy. The film conveys many recognizable moments of family life, whether it's the mother nodding off as she's nursing the baby or little Kun torn between being fascinated by and resentful of his new sibling. Kun's obsession with trains will be familiar to anyone who's parented a child with similar passionate interests. The parents are loving but also have realistic moments of angst, particularly centering around the mother having to quickly return to work. The father is a self-employed architect, and the family home which he designed might have been my favorite thing about the movie. I loved looking around its many levels, and I particularly enjoyed the way the family had a counter which they decorate to celebrate various festivals. As the movie opens, they have an Advent calendar and a small Christmas tree with gifts under it on the shelf; later on, dolls set out for Japan's Doll Festival are a key plot device. The film runs a well-paced 98 minutes, ending before it can wear out its welcome. If only CASTLE IN THE SKY had had a similar running time I probably would have liked it more than I did. 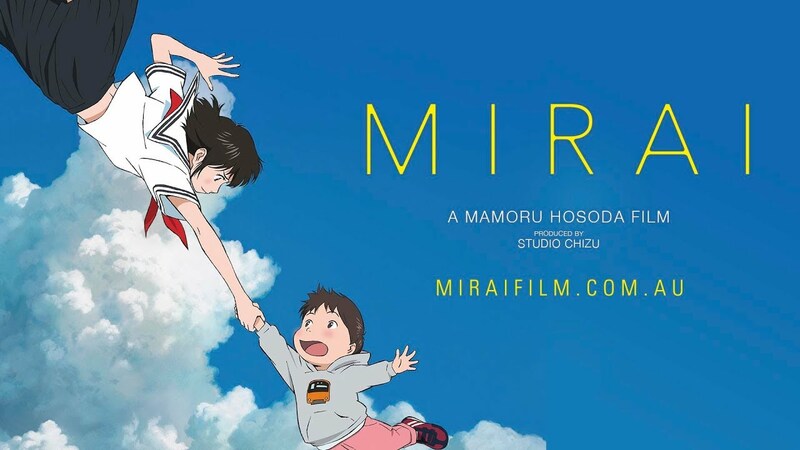 MIRAI was written and directed by Mamoru Hosoda. In an interview shown after the film, he said that the film was inspired by a dream his young son had about his baby sister being older and in a junior high school uniform. He also spoke about how the movie was simultaneously a small story and "epic," about one little family yet also about connections through the generations. I thought his description was apt. The director also pointed out that the film utilizes hand-drawn animation along with CGI, and that very few films are hand drawn anymore. He feels drawing by hand allows animators to present a much more personal, unique work. Parental Advisory: This film is rated PG. There is a frightening sequence on a "train to Lonely Land" when the train is revealed to be populated by skeletons, and there's another sequence where Kun's great-grandfather is shown struggling to survive. Such moments are quite short. For the most part it's an enjoyable, relatable family film with positive messages. 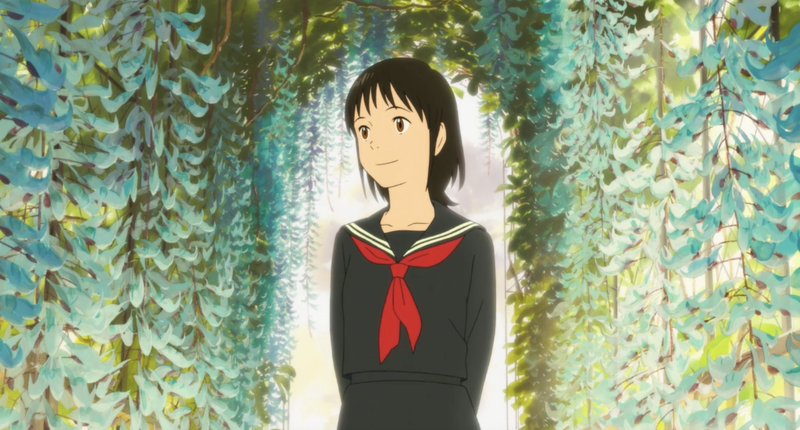 I really enjoy periodically delving into Japanese cartoons and have seen some wonderful films over the last couple of years, including IN THIS CORNER OF THE WORLD (2016) and MY NEIGHBOR TOTORO (1988). It's rather fun to jump into movies like these almost "cold" and discover what they have to offer, and I'm looking forward to seeing more Japanese animation in the future.